For NIMBYs fighting a residential building project in the northeast corner of the Mission on the basis of negative environmental impacts, you might think minimizing the number of new car parking spaces is a good thing. After all, the more parking that goes into a project, the more residents tend to own and drive cars. But at an October 9 hearing on an appeal filed by neighbors against the environmental impact report for a proposed 75-unit residential building at 480 Potrero Avenue (at Mariposa Street), the appellants apparently had Supervisors Malia Cohen and David Campos convinced that if developers failed to provide “enough” parking, new residents will buy cars anyway and just circle around for a spot. According to Juan Jayo of the Mariposa-Utah Neighborhood Association, opponents don’t buy the arguments to the contrary. “The Planning Commission’s response to this simply seems to be … eventually, people would get tired of looking for parking and move to Muni and bicycles and walk, so there would be no impact,” Jayo said. That’s basically correct, though new car-free residents who knowingly move in to an apartment without a dedicated parking spot wouldn’t be circling for parking in the first place. Cohen and Campos, whose districts are near the site, grilled Planning Department staff on its determination that not building parking would not cause a significant environmental impact under the guidelines of the California Environmental Quality Act. Barely mentioned at the hearing, however, was the growing body of research showing that a guaranteed space to store a car is an incentive for residents to own one, and that any number of parking spots deemed necessary to meet some inevitable amount of parking demand is arbitrary. Meanwhile, parking spaces make housing more expensive and more difficult to build. In other words, more parking facilitates more car use — not the other way around. 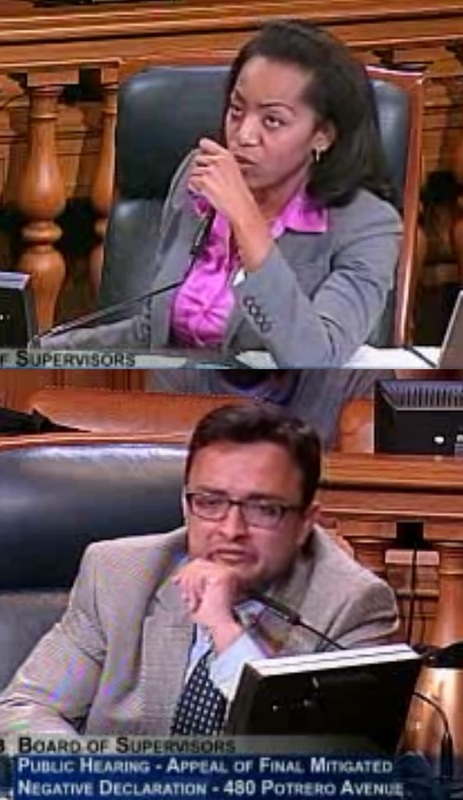 Supervisors Malia Cohen and David Campos attempted to grapple with the dynamics of parking supply and demand. In their fruitless attempts to appease the pro-parking opponents of 480 Potrero, developers have already traded housing for parking. Underground parking spots were increased from 35 to 49, and the number of apartment units from 84 to 75. It’s not clear how much parking the project’s opponents would deem adequate, but the arbitrary nature of their assessment became especially perplexing at certain times. Because the vacant development site was recently used as a 50-space parking lot for a year-and-a-half, they claimed the supposed parking “shortage” would be even greater. The 480 Potrero site is within the upzoned area of the Eastern Neighborhoods Plan. Because the Planning Department completed an environmental impact report for all projects within that area that comply with the plan, 480 Potrero didn’t need its own EIR. In the future, any EIR appeals based on parking “shortages” in the city will be especially frivolous thanks to a state law recently signed by Governor Jerry Brown. As Jones explained, the bill expressly mandates that any addition or “deficit” of car parking will not be considered as part of required environmental analyses for future development and transportation projects within “transit priority areas” in California (which is expected to include most, if not all, of San Francisco). You tell people to rearrange their work-life balance around the constraints of Muni. Are you implying that people should move every time they change jobs? Work in the Outer Sunset? Gonna have to forfeit that rent-controlled property in North Beach and move to the Avenues, because commuting by Muni will be F-ing impossible. Or maybe somebody who bought a parking space decides they no longer need it, and decide to sell it. Chances are, there will be plenty of takers to buy the spot. Either to park a car, or storage unit. Sure. Don’t see why there should be a minimum. The only parking requirements that should be enforced is that garages ought to be 100% underground, and all street parking should cost no less than $5/hour, or $500/month. Driving should be taxed, too, via pervasive tolls. By avoiding Muni, I significantly reduce the likelihood I will get shot or stabbed, so SFGH level 1 trauma surgical expertise is irrelevant to me. Tell that to Tony Bologna. If the parking is bundled with the unit, it can’t be unbundled. And the only way you could legally use it for storage would be to buy a large car, park it in the spot, and put your stuff in the car. You miss my point. Free parking on public property that is paid for by all taxpayers is not a right, nor should you expect the city to provide you with a parking space despite the length of time you might have lived in your residence. Plenty of people structure their lives with this premise and adjust their work life balance to take that into affect. If that means you become constrained by public transport, or riding bicycles, then so be it. It is conceited in the extreme to believe that developers should be restricted from creating new housing without parking because it might impact “their” free on street parking. Those streets are paid for by everyone who pays taxes and the city should be working towards benefitting those who pay for them. We already established that the market rate for secured parking garage space in -building is greater than or equal to $60,000, which means that developers turn a profit from biding underground garage space on the garage itsely, not to mention the fact than 98% of people who earn enough to be able to afford to buy a condo for over $1 million are going to demand parking and place lower value on buildings where an external garage needs to be arranged. Bogus story. Getting up Potrero Hill by bus is not a challenge (bus 10,19 & 48), unless you care about not getting robbed or shot, in which case you are hosed, because there is a shooting every week and robbery every other day on a Potrero Hill bus. there is a shooting every week and robbery every other day on a Potrero Hill bus. As someone noted earlier in the comments section, let developers build parking. In fact, let developers build as much parking as they like. But separate every parking space from the monthly rent or mortgage payment residents pay. If people have to pay upfront every month for their parking spaces, they will limit the number or eliminate owning private automobiles. Developers can figure out how much they can charge for parking spaces and build a number that makes sense. And further, the city should start charging all of us to park our cars overnight or for days at a time on the street. I agree with Gneiss that free storage of private automobiles in public space has to come to a close in any densely built neighborhood. It’s an obscene misuse of the public realm we should all be enjoying, or at least paying to take space away from every other user. I had a similar experience two years ago. But even though our car was handy for getting to the hospital, in retrospect I realize getting an ambulance would’ve been smarter. “Ambulances would not make a run for this.” Are you kidding?? There is a lot of misdirected anger in your post. I never said anything about “rights” or claimed it was “my” street or that the streets belong to the residents along those streets. We are talking about the allocation of a public resource. It is perfectly reasonable for people to ask that streets be allocated in a way that works for them. Why are you so upset about that? Bikers are quite adamant about streets being allocated to bike lanes and they don’t pay for that, Why is it illegitimate for drivers to ask for parking? Parking is a public resource available to all. It also seems to me that is perfectly reasonable to ask for the City to develop in a way that supports all of its residents — not just bicyclists. If a new development is going to adversely affect my quality of life, why shouldn’t I raise that issue? But your last paragraph makes your position clear. You feel free to ignore my concerns because I need to change my life so that it is more like yours. Somehow you think that I can magically change my work life balance and all will be fine. Really? That fact is that biking is not a good solution for the elderly, the disabled and families. Public transit is limited. Those of us who have friends, family and work commitments outside of San Francisco, may need a car some of the time. Working class people can’t afford to pay for parking (and many of them need cars to get their jobs). Your response epitomizes the close-mindedness of the anti-car zealots in this City. You attack straw man arguments in attempt to deny my right to even argue about how city streets to be allocated. You make no attempt to understand the legitimate needs and concerns of others in the community. Instead, you self-righteously assume that the real problem is that other people stubbornly refuse to live their life exactly as you do.